BGC Partners’ 9th annual Charity Day is taking place today, Wednesday, September 11, 2013, and celebrities from around the world are on the trading floor raising money for their chosen charities. BGC Partners began their annual event after the loss of 658 of their employees on September 11, 2001 in the World Trade Center attacks, with 100% of their global revenues from the day being given to hundreds of charities worldwide. Over the past eight years, Charity Day has raised approximately $89 million globally. Twitter has been alive with tweets and photos of all the action in the London offices, with a long list of notables in attendance. 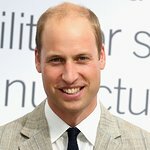 The Duke of Cambridge is raising funds for Skill Force. 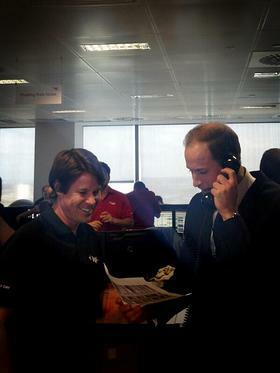 The Duke of Cambridge secures another trade. Prince Harry and Duncan Bannatyne are raising funds for WellChild. 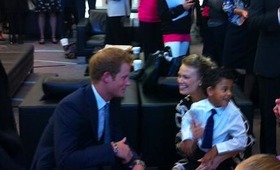 Prince Harry meeting WellChild families at the BGC event. 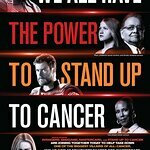 Alex Jones, Melanie C, Chris Evans, Rod Stewart and Penny Lancaster Stewart are answering the phones for Breast Cancer Care. Penny Lancaster Stewart making trades for Breast Cancer Care. Idris Elba is raising funds for MTV’s Staying Alive Foundation. Cerys Matthews and David Hasselhoff have chosen to raise funds for I Can. 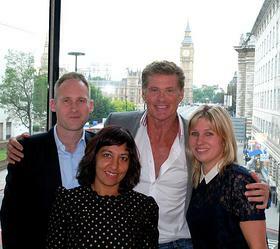 David Hasselhoff meets the I CAN charity team. Athletes Jack Green and Dan Keatings are supporting Right To Play. Jamelia and Heidi Range are raising funds for the Elephant Family. Also in attendance are Rob Brydon, Carmelo Anthony, David Tennant, Tom Parker Bowles, Jimmy Carr. The trading will continue around the globe, with photos and updates appearing on Twitter, #BGCCharityDay. For more information on BGC Partners’ Charity Day and this year’s participating charities, please click here.